Midas Advanced includes new indicators for MIDAS analysis, which expand its capabilities. 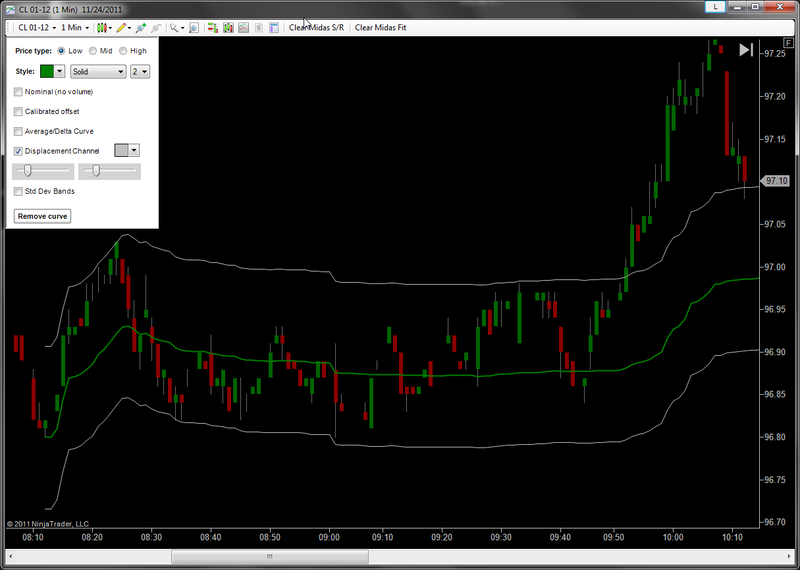 Midas Displacement Channels is a powerful new tool, which can be used for both sideways and trending markets. This approach is especially valuable for sideways markets, but applicable to trending as well. MIDAS channel lines are projected above and below the standard curve. To create Midas Displacement Channels, first launch a normal MIDAS curve. Then from the dropdown, enable "Displacement Channels", and adjust sliders to move the channel curves up or down. They should be moved to the first pullback, and future price will often interact with the channel. Try Midas Extensions to see the next generation of MIDAS indicators. Copyright (C) 2011-2017 by Midas Explorer. All rights reserved.